Plaid fabrics make a great addition to any quilt. 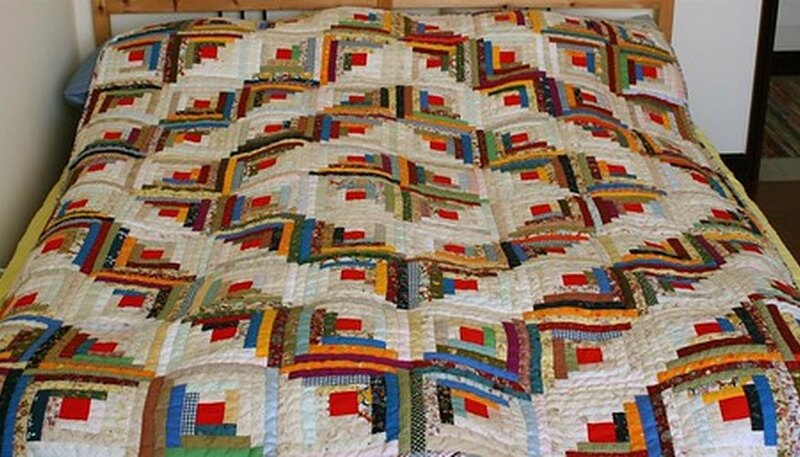 You can make a quilt entirely from plaid or choose a special plaid to accent your other fabrics. Plaids are made from a series of horizontal and vertical lines. Because of this, plaids work well in geometric patchwork patterns like four patch and nine patch. Homespun plaids work perfectly for vintage-style patterns. Choose a Civil War or colonial-style pattern for your plaid fabric. You can use a homespun plaid for some or all the blocks of a "Dear Jane" quilt as well. Scrap quilt patterns are designed to use up odd pieces of fabric, and you should choose which fabrics to use based on color, not pattern. So if the colors of your plaid complement the rest of your scraps, add them to the pile. Log cabin quilts are made from individual strips of fabric, and the strong geometric lines of the finished blocks will showcase your plaid fabric beautifully. Plaids work well for applique—either as the background or as the smaller applique pieces. Using a plaid fabric adds a whimsical touch to your applique quilt.